it's my girls' world: November weekending! - headed to Buffalo with my friend Jenn on Friday to enjoy a little Target, Panera and Trader Joe shopping. - went for an adult only dinner with the family at an Indonesian restaurant. 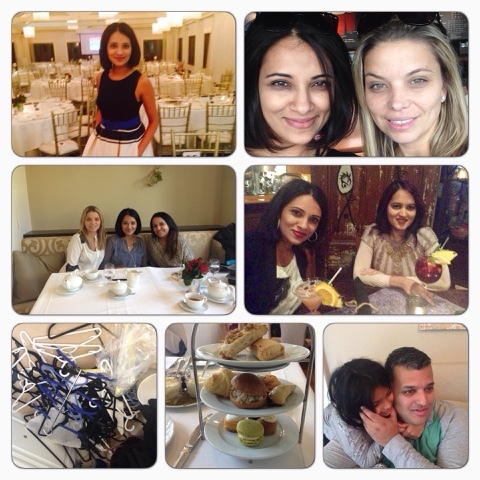 - had High Tea with some of my girlies. - took the littles out for some fresh air and a bite to eat. Happy Monday friends! May the day be short and your coffee strong! I've always wondered how far Buffalo is from TO. Must be nice to have a quick place to flip over to for those things we don't have! Ooh some adult time and high tea sounds so fun!! What a fun weekend! We LOVE Trader Joes! Sounds like a fabulous weekend, and LOVING that dress you wore! Seems like you had a seriously fabulous weekend!! Sounds like a great long weekend. The high tea looks delicious! Panera, Target and Trader Joes?! Sounds like heaven to me. What a great weekend! Those are my 3 favourite spots across the border! We mainly just cross over to Niagara Falls because it's closer and they have everything we need. Do you go down to Buffalo every time you go? I love when weekends begin on Thursday!